iB Food is a leading UK supplier and wholesaler of high quality dried egg pasta and dried durum wheat pasta for chefs, restaurants, catering and the whole food service sector. Our aim is to help the caterer recreate the exciting flavours of authentic Italian and Mediterranean cuisine to a consistent quality using the minimum of labour and time. iB Food’s range of speciality meat dishes are made by traditional methods using authentic recipes from the Emilia Romagna region of northern Italy. Nothing beats authentic Italian dried egg pasta! 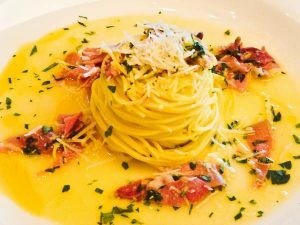 The Japanese do it, the Swiss and Germans do it, the French have been known to do it and even the ancient Greeks did it – eat pasta that is. Today pasta has become a dietary staple all over the world and although records show that the Chinese were eating noodles as early as 5000 B.C., no one knows for sure where it originated. At iB Food, one thing we are certain of is that nothing beats the taste of authentic Italian dried egg pasta. Maybe it’s the insistence on using the freshest, natural ingredients or the passion and dedication with which it’s made that helps create the distinctive taste and texture – the perfect partner to an infinite variety of sauces, meat, vegetable and fish dishes. We want to encourage increased popularity of the wonderful pasta that has formed the staple diet in some parts of Italy for centuries. That’s why our unique range of 36 plus different dried egg pasta shapes reflect traditional regional Italian cuisine. For example, Tonnarelli, or guitar strings as it is known, is square shaped spaghetti which originates from the Abruzzo region. Delicious served with iB Food’s Walnut and Five Cheese sauces. 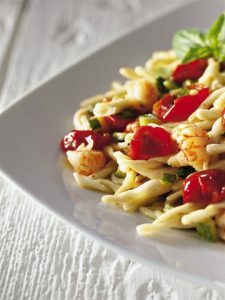 Our pastas look and taste like home made and are available in many unusual shapes and sizes. Overleaf we provide advice on choosing and using our pasta. Try it and see. We guarantee you will not be disappointed. 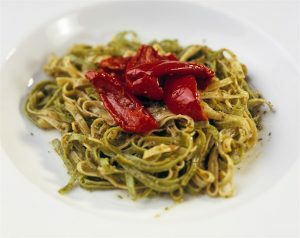 Flat narrow pasta shapes such as Tagliatelle and Taglioline suit smooth and rich or very creamy sauces e.g. Five cheese, Pesto alla Genovese. Curved and tubular pasta shapes like Garganelli & Farfalle have ridges which hold a sauce well. These can be dressed with a robust sauce such as game, or a chunky vegetable sauce such as Pomodorina, Artichoke or Asparagus. Short shapes such as Penne & Maccheroni are becoming more popular especially at business lunches – easier and quicker to eat than long shapes like spaghetti and far less messy! How much pasta to serve – for a main course allow 100g per person of dried egg pasta which will give a substantial portion of 240g of cooked short shaped dried egg pasta. Pasta should be cooked in plenty of water, around three litres to every 500g of pasta. Add 2-3 teaspoons of salt to each 500g of pasta. Cook pasta until it is al dente, which means ‘to the tooth’. The pasta should be firm but with a little resistance to the bite. Two pasta shapes adapt well to baked pasta dishes. Short, tubular shapes like Rigatoni remain evenly distributed throughout the sauce while baking. Large rectangular shapes such as Lasagne make perfect layers between sauces and fillings. Dried egg pasta is made using soft wheat flour and eggs. Standard pasta is made with semolina or hard wheat flour and water. Dried egg pasta therefore has a much richer flavour and looks and tastes like home made. Dried egg pasta remains al dente for longer (can therefore be reheated to order and can be used in salads without losing its shape, flavour or texture), or ideal for hot plate service. Dried egg pastas from iB Food are made with 7 eggs to 1kg of flour which gives a much superior flavour and texture with better sauce retention. Dried egg pasta grows more than any other type of pasta – 100g dry weight of short shaped pasta gives a yield of 240g when cooked. Dried egg pasta stops cooking as soon as it is taken out of the cooking water, unlike dried pasta which absorbs up to three times it’s weight in water and so continues cooking after draining until it has cooled completely. This is why dried pasta and fresh pasta often leave a residue of water on the plate after serving. Dried egg pasta is ready to serve in approx 7 minutes less than half the cooking time of certain dried pastas.